We’d gone up to see the house, the three of us – two younger cousins and myself, to look at it. It stood there, something that so many people fought for over the years, showing it’s age through coats of relatively fresh paint. Some changes had been made since last I was there by the last who had stayed there. The yard was a mess – freshly sprayed to kill the unkempt grass, brown and dry. And as I rounded the corner, I saw the tree that I had planted. When I had last seen it, it was a sapling. 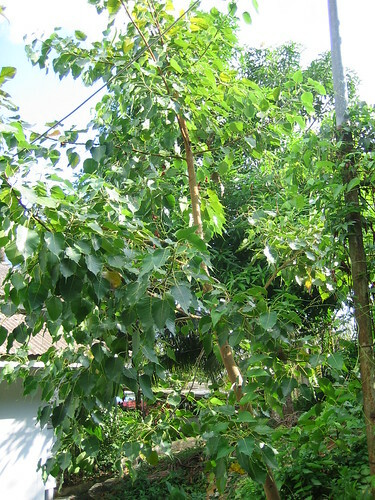 Many years had passed since then and it had surpassed my expectations – now standing close to 70 feet tall, it’s leaves littered the unused concrete path, intermingled with the leaves of the mango tree. It had become magnificent, as unkept as it was. It’s massive roots slithered into the limestone rich earth, branches reaching for the sky- yet invisible from the front of the house unless you knew to look. My cousins were talking as I continued looking around, finding a few other things I had planted that had stood the test of time despite all that had happened around the old house. And then I looked at the house, in the house, around it – age showing here and there, cracks, spot repairs… the roof had a leak, and it had made it’s way through the ceiling at one point. In my mind, this had always been an ugly house. It had been red once. It was white now. The flooring was still solid inside, but in the gallery I knew what lay beneath the linoleum. I knew where to look for the cracks, and I saw them – knew them intimately. My cousins were still talking about this and that, and how the trees needed to be trimmed, that I was thinking about it all. “It’s a project”, is all I really added, as in the back of my mind, knowing that the leaves were bad for the galvanized steel roof. And in the back of my mind, with decades of knowing the house and all that used it as a pawn in their petty fighting, the idea of blades touching that tree was grotesque while the idea of that house being damaged did not bother me at all. I planted that tree for reasons. I watered that sapling for years. That tree and I had spent more time together over the years than I had with any living family member. To stand under the shade of that tree, which I did not expect to do, was a reprieve. Yes, I’d rather water that tree than fix that house. I’d rather it grow unmanaged, strong, with deep roots and strong branches, and I cannot take a blade to it or tell someone else to do that. And yet I cannot stop what will happen to it, either, for it is not in my yard. If it were, the house would have been torn down long ago and a smaller dwelling put in it’s place. This is why you should not plant a tree in someone else’s yard. < Previous The Audience: Know It.